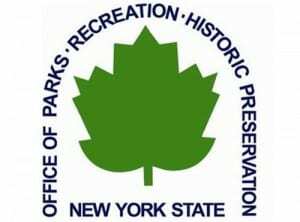 The National Park Service has announced that it has listed the New York State Barge Canal on the National Register of Historic Places. 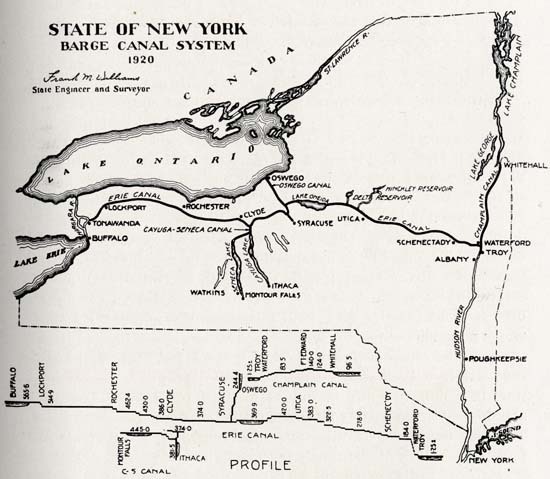 The designation recognizes the New York State Canal System as a nationally significant work of early twentieth century engineering and construction that affected transportation and maritime commerce for nearly half a century. 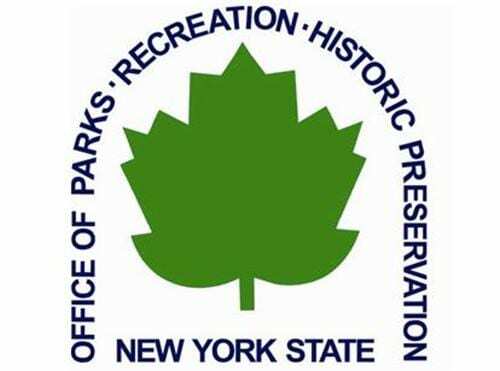 The New York State Board of Historic Preservation has announced that 28 sites have been nominated to the State and National Registers of Historic Places. The Barge Canal Historic District was one of the properties, resources and districts across the state advanced for the historic designation. 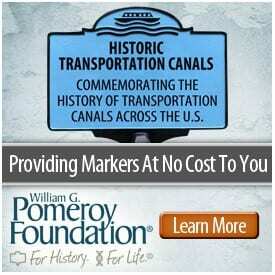 In recognition of a near century of service, Erie Canalway National Heritage Corridor – in collaboration with the NYS Canal Corporation, the Heritage Documentation Program of the National Park Service, and NYS Office of Parks, Recreation, and Historic Preservation – is sponsoring the nomination of the NYS Barge Canal System to the National Register of Historic Places. The New York State Board for Historic Preservation has recommended the addition of 21 properties, resources and districts to the State and National Registers of Historic Places. 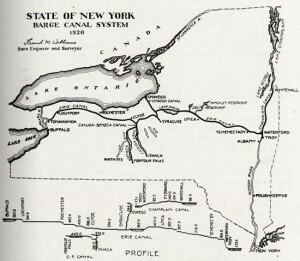 The New York State Board for Historic Preservation recommended the addition of 31 properties and districts to the State and National Registers of Historic Places, including a Lake Champlain shipwreck, a post-World War II auto dealership, and a 200-year-old Catskill inn that survived the catastrophic floods of Tropical Storm Irene. The Dr. Wesley Blaisdell home, Coeymans – the imposing 1838 Greek Revival-style home constructed by Dr. Wesley Blaisdell, physician and son of a wealthy landowner, remains a visual landmark in the local community and stands as a monument to several of the community’s leading citizens and families. Cottage Farm, Fair Haven – one of the oldest seasonal houses in the village of Fair Haven was originally built in the 1830s and extensively remodeled around 1880 and again in 1910, and is a reminder of the village’s long tradition of being a seasonal vacation destination on Lake Ontario. The Bartlett House, Ghent — the former railroad hotel built in 1870 was at one time the centerpiece of a cluster of buildings, many of which have fallen away, that marked the intersection of the New York & Harlem Valley and Berkshire Railroads, providing a link to the post-Civil War growth of the hamlet. Copake Falls Methodist Episcopal Church, Copake – dedicated in 1892, the highly intact example of ruralLate Victorian era ecclesiastical design was built on land donated to the group by the Miles family, which was associated with the nearby Copake Iron Works, and is now home of the Roeliff Jansen Historical Society. The Daniel and Clarissa Baldwin House, Spencertown – built in1807, it is a distinctive example of Federalperiod domestic architecture reflecting the influence of New England construction methods brought west by the hamlet’s early settlers, who largely came from overpopulated regions of Connecticut. The American Grain Complex, Buffalo – the intact collection of early 19th century buildings embody the tale of Buffalo’s leading role in transshipment of grain from the Midwest to the East, and the handling of grain to produce malt for the brewing industry and flour for the baking industry. The Automobile Club of Buffalo, Clarence – the 1910 Craftsman-style building housed the automobile club that not only brought together early automobile enthusiasts, but lobbied for pro-motorist legislation that was integral to the development of the automobile generally and of paved roads throughout New York State. Buffalo Meter Company Building, Buffalo – the 1915 building is an excellent and largely intact example of a reinforced concrete frame daylight factory celebrated their structure and functionality with minimal ornament were highly influential to Modern Architecture. The Canal Boat Vergennes – a rare example of a class of mid-19th century Champlain canal boat that was archaeologically unknown until the shipwreck’s discovery in 1998, it is significant for the understanding it can provide for both the history of the Champlain Canal and the evolution of canal boat construction. John and Martinus Laraway Inn, Prattsville — a distinctive example of late Federal/early Greek Revival design, the inn was constructed ( in part) in the late 18th century to become one of the region’s most recognizable visual landmarks, hosted the town’s first organizational meeting in 1833, and survived catastrophic flooding in 2011. The Wallabout Industrial Historic District, Brooklyn –lined predominately with late-19th and early- to mid-20th-century industrial buildings, the district reflects the paramount importance of industry in Brooklyn as it developed into one of America’s major industrial centers. Church of Saints Peter and Paul Complex, Rochester – built between 1911 and 1926, the excellent example of the Italian Renaissance Revival style was built by a parish organized to meet the needs of the growing Catholic German immigrant population in the city. George J. Michelsen Furniture Factory, Rochester — built in 1914 for one of Rochester’s longest-running family concerns, the imposing industrial building was home to a company that survived the Depression, unlike many Rochester furniture makers, and continued to manufacture bedroom furniture at the site until the late 1950s. William A. Payne House, Greece – the 1905 Queen Anne-style home was owned by William A. Payne, who made an impact on local and state commercial practices through his leadership in developing fair and uniform methods of weighing and measuring for merchants and consumers. First Presbyterian Manse (also known as the Lavinia E. Porter House), Niagara Falls – Located on Buffalo Avenue, the Italianate-style home built before 1851 in one of the city’s oldest sections is one of two mid-19th century houses left in an area that consists mostly of 20th century hotels and commercial buildings. Wright Settlement Cemetery, Rome – the cemetery records the lives of the families who settled the town after the Revolutionary War, which is especially important in light of the fact that physical links to the farming community were lost to the development of the Rome Air Depot in 1941. Scottholm Tract Historic District, Syracuse – largely developed between 1915 and 1940 at the transition between the streetcar and automobile, the subdivision represents the growth of single-family residential enclaves within the city, with curving boulevards featuring dense tree-cover, large lots, and a variety of architectural styles. Denniston, New Windsor – Built in 1875, the house is a rare and architecturally significant example of non-reinforced concrete construction in the mid-Hudson Valley. Union Chapel, Cornwall-on-Hudson — built in 1873, it was erected by Cornwall’s Orthodox Quakers in the post-Civil War period to extend of religion to the residents of Cornwall Landing, and served as both a Quaker mission and Sunday school, at times non-denominational, before eventually falling into disuse. The Clarendon Stone Store, Clarendon – Constructed in 1836 from locally quarried Medina sandstone, the rare surviving example of an early 19th century stone store played a central role in village life, also housing the post office, the town clerk’s office and the town court at different times. Payjack Chevrolet Building, Medina – built in 1949 in accordance with modern design principles General Motors encouraged its dealers to adopt after World War II, the business known today as Hartway Chevrolet is one of the few remaining from Medina’s “Automobile Row” at the edge of the village’s commercial center. Brookside, Upper Nyack – built around 1865 and substantially enlarged and modified around 1890, the home is a noteworthy example of the large villas which were central features of estates developed in the Hudson River corridor by the affluent in the 19th century. Seaman-Knapp House, Ladentown – erected sometime near the turn of the 19th century, the house reflects both Dutch and English vernacular building traditions and was at one point used as a place of assembly for religious purposes by the local Quaker community. Hepburn Library of Colton – the 1912 library, notable for its rustic stonework, was endowed by Colton native Alonzo Barton Hepburn, a successful lawyer, banker and state and federal government official, who donated an estimated $3 million for construction of libraries, schools and hospitals in St. Lawrence County and elsewhere. Stewart House and Howard-Stewart Family Cemetery, South Jefferson – the 1850s home is a high intact example of a Greek Revival farmhouse and the cemetery reflects rural 19th century burial practices when family members were buried on their own properties. Riverhead Main Street Historic District, Riverhead – strategically located on the Peconic River and at the split of Long Island’s North and South Forks, the concentration of buildings represents Riverhead’s importance as the center of business, culture, entertainment and government on the East End of Long Island. Ellenville Historic District, Ellenville — the historic district illustrates how forces from the development of the Delaware and Hudson Canal in the early 19th century to the role of the “Borscht Belt” era summer resort economy following the Second World War shaped the commercial core of the crossroads village. 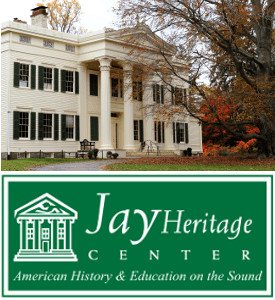 Pine Hill Historic District, Pine Hill – the cohesive collection of late 19th century and early 20th century buildings represent the heyday of summer tourism in the Catskill Mountains. Dale Cemetery, Ossining – incorporated in 1852 and laid out in the rural cemetery tradition, with winding paths set along forested gentle hillsides, the cemetery retains much of its mid-19th century plan and is the final resting place of many of Westchester County’s prominent citizens. Downtown Ossining Historic District (Boundary Expansion) – the boundary expansion includes four contributing buildings that were not included in the 1988 nomination, but which are characteristic of the historic district’s 1840 to 1933 period of significance. First Free Will Baptist Church, Pike – the 1881 structure is a representative example of a late 19th century Gothic Revival-style church and the last surviving historic religious building in the small rural community. 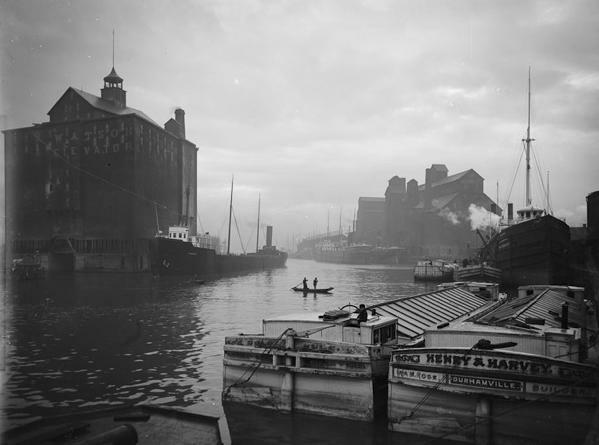 Photo: Grain elevators and canal boats in Buffalo Harbor. The New York State Board for Historic Preservation recommended the addition of 39 properties to the State and National Registers of Historic Places, including the nation’s first fish hatchery, the neighborhood that grew up near the Brooklyn Naval Yard, and a roadside souvenir stand modeled after a tepee. Potter Hollow District #19 School, Potter Hollow – constructed in 1853 in response to the educational reform movements of the mid-nineteenth century, the rural vernacular one-room schoolhouse retains an exceptionally high degree of architectural integrity. Dollar Savings Bank, Bronx – today the Bronx Temple Seventh Day Adventist Church, the 1919 bank is a distinguished example of Classical Revival design that reflects the commercial history of one of the most important banking institutions in the Bronx. Harlow E. Bundy House, Binghamton – the Queen Anne-style home was built in 1893 by Harlow Bundy, a founder of the Bundy Manufacturing Company, a leading producer of mechanical time clocks, which was the precursor of IBM. Riverside Cemetery, Lowman – one of the earliest surviving cemeteries in Chemung County, it is the final resting place of many of the area’s earliest settlers, including several veterans of the American Revolution and the War of 1812, most of whose homes and farms have vanished. Heyworth-Mason Industrial Building, Peru – the 1836 structure is an example of an early stone industrial building that housed A. Mason and Sons Lumber Company, a firm that operated for 90 years and greatly impacted the building industry in Clinton and Essex Counties. William J. Greenman House, Cortland – the 1896 Queen Anne-style house is based on a design of George Franklin Barber, an early and successful proponent of “house by mail” plans, for local manufacturer William Greenman. Schoolhouse No. 5, Hamden – a mid-19th century rural one-room schoolhouse built in the winter of 1857-1858, sometimes known as Upper Dunk Hill School, which includes a schoolyard defined by a stone wall and mature trees planted by students to mark Arbor Day. Buffalo Seminary, Buffalo – an excellent example of the Collegiate Gothic-style, the 1909 building houses a significant educational institution which has served the Buffalo community for over 150 years and has produced numerous graduates who have made significant contributions to Buffalo and the nation. University Park Historic District, Buffalo – a remarkably intact example of an early-20th century planned residential subdivision, reflecting the importance of the streetcar and the rise of automobile use in determining the city’s expansion. Twentieth Century Club, Buffalo – built in 1896, the elegant Classical Revival clubhouse reflects the growth of the national women’s club movement and the increased influence of women generally in American life. Engine House #2 and Hook & Ladder #9, Buffalo – originally constructed in 1875 to serve the needs of the rapidly growing city and its Allentown neighborhood, the Second Empire-style firehouse was expanded in 1896 to provide additional space for the Hook & Ladder #9. Crandall Marine Railway, Ticonderoga – the rare and remarkably intact 1927 railway dry dock facility was, and still is, used by the Lake George Steamboat Company to haul its excursion boats in and out of Lake George for maintenance and storage. Hotel Broadalbin, Broadalbin – originally built in 1854 as a specialty store selling gloves manufactured at the local Northrup & Richards glove factory, it was greatly enlarged in 1881 for use as a hotel for the growing numbers of tourists visiting the Adirondacks. Oak Hill Cemetery, Oak Hill – the small, 5.6-acre cemetery originated as the burial place of early settlers Lucas and Deborah DeWitt on their family farm in the early 1820s, and evolved quickly into a community cemetery for residents of the hamlet. Frankfort Hill District #10 School, Frankfort Hill – constructed in 1846, the vernacular building retains a high degree of architectural integrity and remarkably served as an active public school for 110 years until 1956. Wallabout Historic District, Brooklyn – primarily residential buildings built between 1830 and 1930 – and especially rich in pre-Civil War wood houses – the district developed as Brooklyn’s residential development moved eastward and laborers came to work at the Brooklyn Navy Yard. Stoddard-O’Connor House, Lowville – built in 1898, the Queen Anne/Colonial Revival-inspired home is adjacent to the commercial heart of Lowville, which was experiencing ample growth during the turn of the last century. Mary Lyon Fisher Memorial Chapel, Lyonsdale – the late Gothic Revival masonry chapel in Wildwood Cemetery was built in 1921 by the children of Mary Lyon Fisher in honor of their mother, and is an important reminder of the philanthropy of the Lyon family, a preeminent family of the region. Caledonia Fish Hatchery, Caledonia – the property is nationally historically significant for its association with Seth Green, who established the first fish hatchery in the western hemisphere in 1864, creating what has been acclaimed nationally and internationally as the world’s largest and most productive fish plant in continuous use. Brockport Central Rural High School, Brockport – completed in 1934, today’s A.D. Oliver School is notable for its distinctive English Tudor Revival design, as well as its interior details, especially the auditorium’s stained-glass windows, which illustrate American historic figures. Oatka Cemetery, Oak Hill – a late 19th century rural cemetery, which was attached to and merged with an earlier burying ground, known as Scottsville Cemetery, and contains markers of the area’s citizens from the early 19th century to the present. Van Wie Farmstead, (Valley View Farm) McKinley – the 1873 farmhouse based on Italianate-inspired pattern book architecture and associated farm buildings and acreage tell the story of changes in Mohawk Valley agricultural production, from the earliest 18th century wheat farmers to mechanized dairy production in the mid-20th century. The Stephen Harding House and Studio, Sea Cliff – built in 1878 by photographer Stephen Harding as one of the original homes during the period when Methodist Camp Meetings were held in Sea Cliff. Hazard H. Sheldon House, Niagara Falls – the 1857 ‘Italian Villa’ was the home Hazard H. Sheldon, a lawyer who played an important role in the civic affairs of the then-burgeoning Village of Niagara Falls. Huntley Apartments, Syracuse – constructed in 1928, and originally known as the Asaranaba, it reflects a trend in the city that saw the acceptance of apartment living on the part of the middle class in a city previously dominated by the single-family or two-family house. Gilbertsville Water Works, Gilbertsville – in response to a series of large fires, the village of Gilbertsville was incorporated in 1896 with the specific purpose of establishing the water supply system, which it enlarged in 1914-18, and continues in use today. The Tepee, Cherry Valley – an example of popular roadside architecture, the Tepee was built in 1954 by Ken and Iris Gurney, natives of Nebraska, where tepees were especially popular, who moved to upstate New York and decided to take advantage of growing automobile traffic along Route 20 to open a souvenir stand. Dickinson Hill Fire Tower, Grafton – erected in 1924 by the New York State Conservation Commission in what is now Grafton Lakes State Park, it was one of more than 100 built after 1908 to identify fires and put them out before causing extensive loss of forest, open land, buildings, and wildlife. Rockland Road Bridge Historic District, Piermont – the district includes a masonry arch bridge erected in 1874 to span the Sparkill Creek along with several nearby properties portraying various periods in the hamlet’s development. Gurnee-Sherwood House, Wesley Hills – built in the 1790s and subsequently enlarged around 1830 during its ownership by Reverend James Sherwood, a Methodist clergyman who played a central role in the development of the area.Christ Church, Sparkill – built in 1864, the church remains a largely intact and noteworthy example of Gothic Revival-style religious design. Young Memorial Church, Brier Hill – built 1907-1908, the church is an intact example of the Shingle style, featuring a two-story square Gothic bell tower and decorative windows of opaque glass and stained glass medallions and portraits made by a local artisan. Smith’s Grain and Feed Store, Elnora – constructed in 1892, the store served the local farm community for generations by selling feed, grain, coal, fertilizers and other goods that were transported to the store by the railroad, which unloaded at the store’s own siding. Cottages at Central Point, Hammondsport – built in the 1880s, the four cottages are a remarkably intact collection of picturesque seasonal vacation houses in the Finger Lakes, reflecting the beginnings of the residential development patterns that have come to dominate the region. Forestburgh Town Hall, Forestburgh – unaltered since its construction in 1927, the structure’s specifications exactly match the original town hall that burned to the ground the year before. Fort George, Lake George – archaeological investigations at the French and Indian War site have provided rare insights into New York’s colonial wars and it reflects early and successful public initiatives in land conservation and commemoration. Perry Downtown Historic District, Perry – the village district of commercial, civic and mixed use buildings reflects the growth and development of Perry as a regional commercial hub and the center of a booming textile industry from roughly 1830 to 1930.